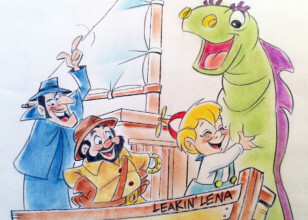 No matter how seasick Cecil the Sea Serpent ever got, his love for his pal Beany is never in doubt. These best friends and their adventures will always bring a smile to the faces of fans the world over. Even the band AC/DC showed their enthusiasm when they named the song “Dirty Deeds Done Dirt Cheap” after what is written on Dishonest John’s business cards. If Beany and Cecil flip AC/DC’s lids, they must be pretty cool and have serious cartoon staying power! Pals on Parade was created by master animator Willie Ito, who has had a storied career that has spanned over 60 years, has had a hand in some of the greatest classic cartoons in almost every major animated studio as a character animator and layout artist. 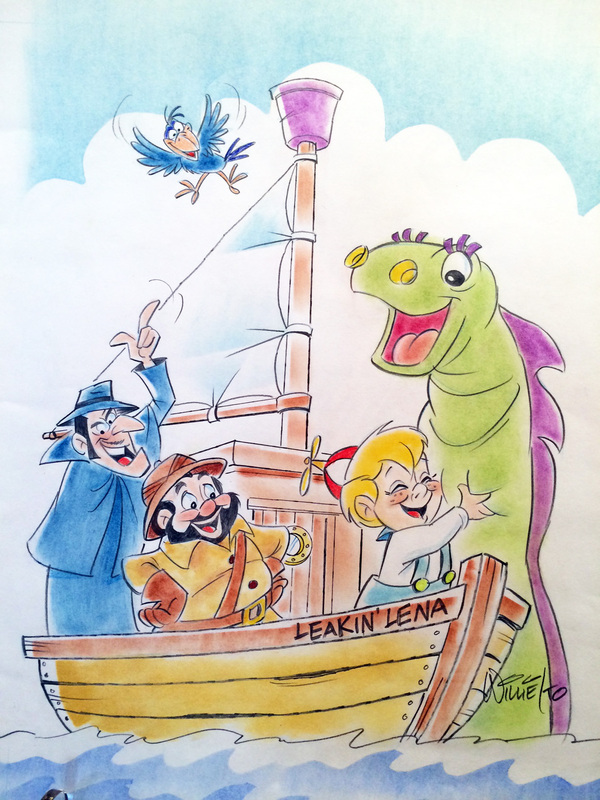 Disney, Warner Bros., Bob Clampett Productions, and Hanna Barbera have all benefited from his creativity and talent. THIS IS A ONE-OF-A-KIND ORIGINAL ART WORK BY WILLIE ITO. 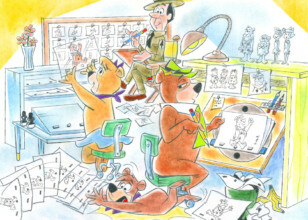 With nearly 60 years as an animation artist, Willie Ito has done it all. He worked at Disney on Lady and the Tramp’s spaghetti scene with mentor Iwao Takamoto and on One Froggy Evening and What’s Opera Doc at Warner Bros’ famed Termite Terrace under Chuck Jones’ direction. 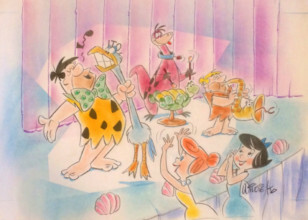 He went on to The Beany and Cecil Show with Bob Clampett and then Hanna Barbera for the beginnings of The Flintstones,The Jetsons and many other cartoons. After HB he went to Disney Consumer Products and spearheaded implementation of collectibles and licensed products worldwide! He has also designed comic books, comic strips, coloring books, and more. He also spent part of his childhood in a Japanese internment camp, which inspired his most recent venture, a series of children’s picture books based on the experience. For a transcript of Art Insight Magazine's interview with Willie Ito about his work and being featured as a special guest at 2014's San Diego Comin-Con, please visit here. From the moment he saw the Technicolored splendors of Disney’s first animated feature, Willie Ito knew what he wanted to do by way of a career. "I saw those dwarfs marching across that log bridge, and I was hooked. I knew I wanted cartooning to be my life’s work." Willie Ito grew up in San Francisco (with a two-and-a-half year residency at a World War II internment camp), but when he finished high school Mr. Ito headed for Chouinard Art Institute in Los Angeles to pursue his passion for drawing. However, his art education was cut short when he found himself hired by Walt Disney Productions to work on Lady and the Tramp. From that day on, full-time college attendance was a thing of Willie’s past. Following his Disney stint, Willie found himself working for every major animation studio in town. A six-year run at Warner Bros. 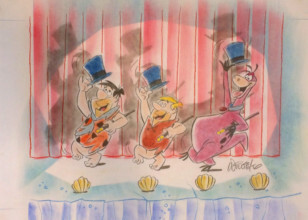 Animation (where he labored at the old “Termite Terrace” for the last twelve months of its life) was followed by a turn at Snow Ball Productions and and then fourteen years in design and layout at Hanna-Barbera. Finally wearying of the animation grind, he veered into character merchandising work with the Disney Co. in the late 1970s. And there he spent twenty-three years designing toys and collectibles, with only one trip back into animation as a key player of the small artistic team that launched Disney Television Animation.